It’s been quite some time since I got to be alone with art (I mean small-a art – visual constructions, not big-A Art – person named Arthur who had his name chopped down to a three-letter word; I don’t know any of the latter). But this past weekend I had some business to do in the big city – Vancouver, to be precise, a five-hour trip over the mountains – and when I was finished with what I had to do, I indulged myself with a visit to the Art Gallery. It was lovely. They had a show of a collection that included works by Cezanne, Manet and Toulouse-Lautrec, and another of Chinese art that examines the interaction of traditional art with the modern. It was in the latter, when I was standing in front of a marvellous work – an installation of ceramic art by Liu Jianhua – that suddenly a realisation took shape in my mind: visual art is something I need to experience alone. Inside my head, I was having a dialogue with an imaginary partner, telling them (it’s not a specific him or her, or it, for that matter) what I thought of this piece – half-baked sentences that bubbled up and sunk away again unfinished as my mind walked through the visual realities in front of me and then moved on to the next piece, focused on seeing. I was looking, I was responding – I was, pretentious though it may sound, communing with the art work. In the fabulous art instruction book Drawing on the Right Side of the Brain author Betty Edwards talks about how visual art, or visual perception, primarily takes place in the right hemisphere of the brain, while the brain’s language centre is located in the left. Because of that, it’s not uncommon for artists to be unable to draw and talk at the same time. I know that’s certainly true for me – if I want to really focus on what I’m doing visually, my flow of words dries up. I’ve had friends say “Let’s get together and make art!” Well, actually – that doesn’t do much for me. Sure, I have fun hanging around with friends and mucking about with art supplies, no question of that; but the result is practically never one of my better pieces, artistically speaking. If I am with another person, my thoughts are focused on that person – and as I think in words, by definition my brain is stuck in the wrong modus operandi for thinking of art. If I’m talking to someone else, I cannot communicate with the art. So art is something I need to experience alone. In order to get the most of a visit to an art museum or art gallery, especially one of the calibre of the Vancouver Art Gallery, I need to be by myself. I need to be able to get stuck in front of a piece that grips me, just staring at it, letting it impact me, without having to get back out of myself and explain to whomever I’m with. It’s not that I don’t enjoy looking at art, or making art, with friends – but the experience of the art will be far more shallow than anything I could get on my own. I’d never realised it quite like that before – but for real depth, it has to be just me and the art. So, what did you do last week? Me, I went on a date; we had some great conversations, myself and an installation of Chinese ceramics in celadon and oxblood glazes. We got real close. Life, the Universe, Myself and Art. It’s got to be just the two of us. PS: I wanted to post a picture of that marvellous Liu Jianhua piece, “Container”, but sadly, I don’t think it would be right under the fair use copyright law. If you go here and scroll down, the second picture on the left is of an earlier installation of the same work; at the VAG it was sitting on white ground, which made it even more amazing. But just so you’re not deprived of a photo of an interesting piece of pottery, here’s one of mine: “Squashpot, Untitled (2011)”. Yes, I know, it’s stunning. For today’s Check It Out let’s mix things up a bit: instead of a book, I want to introduce a song to you. Reader, meet Song, Song, Reader. Oh, that didn’t do it? Well, how about this: Check It Out: “Patrick’s Song”, by Norm Strauss, from his new album The Color of Everything. It being St Patrick’s Day and all – the song tells his story. If you want to know what actually happened sixteen hundred years ago to make St Patrick who he was, give it a listen (and no, shamrocks, shillelaghs and leprechauns don’t come into it). Go to the link, and click on the play button underneath the album cover; you get to listen to quite a sizable chunk of the song there. I highly recommend you spend the buck and download the full song [Addendum! See PS below!] – or better yet, spend the tenner and get the whole album. “Patrick’s Song” is only one of my favourites in the collection; for the others, it’s a toss-up between “Late Bloomer”, “Immigrant” (a song about a German immigrant coming to Canada in 1952 – a topic that is, as you can probably imagine, close to my heart), “The Roofer”, and the title song “The Color of Everything”. Norm’s songs always have a story behind them – if you click on “info” beside the blue download button, you can read the lyrics and find out the background of the songs. Incidentally, yes, Norm is related to Lee Strauss, whose books I’ve advertised here before – they’ve been married for close on thirty years. So much awesome art in one family. Life, the Universe, and “Patrick’s Song”. Happy St Pat’s! PS: Oy!! Just after I first posted this I saw a post from Norm – the song is free today!! Go here and get your free download so you can enjoy the whole thing. How great is that? Filed under Check It Out! For the second time in as many weeks, the nerd world is having to say goodbye to one of its Greats: Sir Terry Pratchett passed away today from Alzheimer’s disease. Leonard Nimoy had reached a good old age; Terry Pratchett was still comparatively young – only 66. But his passing, too, was not unexpected; the disease had been claiming him bit by bit for nearly eight years now. Alzheimer’s has a way of doing that. I think for the bereaved, the mourning has often been done long ahead of the time they actually die, because the person you love has already gone. That’s what happened with a relative of ours – she spent the last ten years of her life slowly disappearing. The real grief was the point of realising that she was no longer who she had been, years ahead of the time of her actual death. With Terry Pratchett, as a reader and fan I found that that point of grief (which is, of course, no comparison to the grief his family feels – but still is a reality) occurred last summer when I read his last book, Raising Steam. It was sad. To me, Raising Steam feels like a book that was ghost-written by someone who is trying to write like Pratchett, but isn’t making it – almost like a fanfic of his work. The voices of the characters are wrong, the world seems off, the plot is – I’m sorry, I have to say it – lame. In fact, I found it hard to believe this was really Pratchett writing – I kept checking online to see if there wasn’t some indication that this was the work of a ghost writer. It wasn’t. And the only reason I felt that way is because I’ve read every single other Discworld book of his, and most of his other novels as well, from The Carpet People onwards, and I’m so familiar with the way he wrote before the disease took it away. Pratchett was brilliant, sparklingly, amazingly brilliant. He could go from laugh-out-loud funny to smack-you-between-the-eyebrows profound in the same sentence – or even better yet, footnote. His footnotes are an art form in itself. I propose that we coin a new phrase in his honour: how about “pratchetting a footnote”? Hilariously witty non sequiturs which manage to pack a little bit of sharp truth into a paragraph squished at the bottom of a page. And more often than not, the footnotes have footnotes, themselves. Nobody wrote footnotes, sub-footnotes, and sub-footnotelets like Pratchett. However, what he excelled in above all was character creation. On Twitter this morning, someone said they are not just mourning the loss of Terry Pratchett, but of his characters. My reaction to that was surprise. Pratchett’s passing is sad – but his characters, to my thinking, gloriously live on. He created Sam Vimes, Captain Carrot, Granny Weatherwax, Nanny Ogg, Tiffany Aching, Lord Vetinari, Rincewind, the Librarian, DEATH (how could I forget Death? ), the Wee Free Men (Och! Crivens! )… so many, many others – and because he created them, they will always exist. The Power of Story does not wane with the passing of its creator. Whenever I choose, I can pull one of Pratchett’s books off the shelf, immerse myself in the world he created, and associate with the people who sprang from his imagination. Whenever it suits me. And that reminds me of one of his oh-so-quotable lines from the opening scene of the book that is one of my favourites of his, Wyrd Sisters. The setting: a violent thunderstorm on “dark, rain-lashed hills”. The problem with blogging is that there comes a point when you feel the pressure to produce something. To come up with erudite, witty, cohesive pieces of writing on a regular basis because you figure that your readers expect it of you. (That’s on the assumption that you have readers. Let’s hold onto that illusion, shall we?) Well, I’ve had quite a few ideas for posts this past week, but I just didn’t get around to solidifying them in writing. And as with many things in life, if you don’t strike [the keys on the keyboard] while the [literary] iron is hot, you lose it. But then it occurred to me that there’s no reason it always has to be cohesive, erudite or witty, never mind profound. Sometimes, life is made up of little bits and pieces, the mosaic of existence. So today, for your edification, amusement or wastage of time, here is a mishmash of matters – just some stuff going on in my life or going through my head. a) I just finished reading Seraphina by Rachel Hartman. (Thank you, E. L. Bates, for recommending it!) That is one fantastic book. I’m so glad I only read it just now; the sequel (Shadow Scale) is coming out tomorrow, so I don’t have long to wait for hearing more about Seraphina and her world. I bought the Kindle version, which happens to be on sale at the moment, and then I got a paper copy out of the library because a real book is still so much nicer to read. I’m not going to write a big review; others have done that. But just one point: the book is full of dragons who all have Asperger’s. It’s awesome. b) Spring has hit in full force, more than a month earlier than we got it the last couple of years. Canada is, literally, polarised right now – while here in the West we’re scrambling to get our rear in gear and start our seedlings, the East is buried under a white blanket. Pretty soon we’ll have to start talking about the East Pole and the West Pole… So on that note, I’ll have to get myself out into the garden today, resurrect the beds from their winter slumber, and get the radishes, lettuces, peas and kohlrabis into the ground. Life, the Universe, and Today’s Mishmash. I’ll tell you more when I think of it. I just finished re-reading E. L. Bates‘ Magic Most Deadly. It’s Agatha Christie meets Harry Potter – or, to put it another way, Christie’s Tommy & Tuppence crossed with Patricia C. Wrede and Caroline Stevermer’s The Enchanted Chocolate Pot (which, in turn, is Jane Austen/Georgette Heyer with magic). Ugh, too many analogies, which only the true aficionados among you will understand. 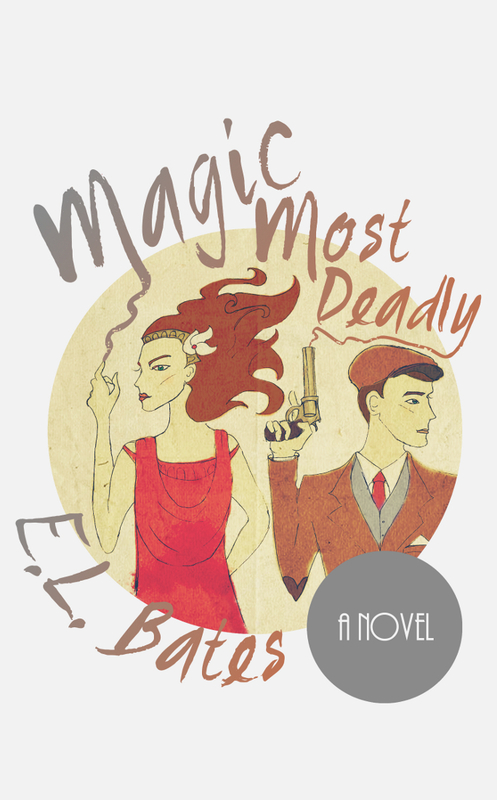 To put it quite plainly: Magic Most Deadly is a 1920’s murder mystery with magic. And it’s great. The main character is Maia Whitney, a young woman who served as a nurse in the Great War. Maia is eminently likeable, and what’s more, quite real. She’s intelligent, she’s capable – but she reads quite true as a young woman who needs to find out who she really is. What I particularly like about her is that even though she has no qualms about taking drastic action when the situation calls for it, she doesn’t just shrug off the experience and go on her merry way – she needs time to process it, to come to terms with her actions and with its consequences. Maia is both sensible and sensitive, and the reader gets to appreciate both of those sides to her, and to enjoy her growth as she makes her way through the events of this story. Maia’s relationship with Len is very believable, too, and the more so for Maia’s not spending most of the book bellyaching about him and how she should react or relate to him – and vice versa. The focus of the plot is the mystery – in a sense, a “magic mystery” as much of a “murder mystery”. We know fairly early on “whodunnit” (at least we think we do – did he actually do it, or not? ), but the real question is what is really going on – and what’s it all have to do with magic, which Maia is only just discovering exists. It’s an intriguing story which keeps me reading, and keeps me rooting for the characters. And at the end of it it leaves me wanting more. I sure hope to see more Maia and Len stories in the future! For Maia Whitney, life after the Great War is dull, monotonous, and drab. Nursing soldiers in the bloody fields of France hadn’t been easy, but it was better than life at home, standing in her sisters’ shadows. There seems no chance for a change until the night she witnesses a murder in the woods. The last thing Magic Intelligence Agent Lennox Davies needs is this outspoken, independent lady crashing his investigation. Bad enough that a murder happened on his watch; much less that she had to see it happen. He works alone, and he does not have time for Miss Maia Whitney’s interference. But as Maia’s own magical talent blossoms and danger thickens around the two with every step they take, before long Len and Maia must rely on each other in a fashion neither has ever done before. If they can’t learn to work together, England itself might topple. Even worse, if Maia doesn’t learn to control her magic soon, she might do more to destroy them even than their shadowy enemy. Can they set aside their stubbornness and self-reliance in time to save themselves—and all England? Available through Amazon, Smashwords, Nook, and soon-to-come iTunes.